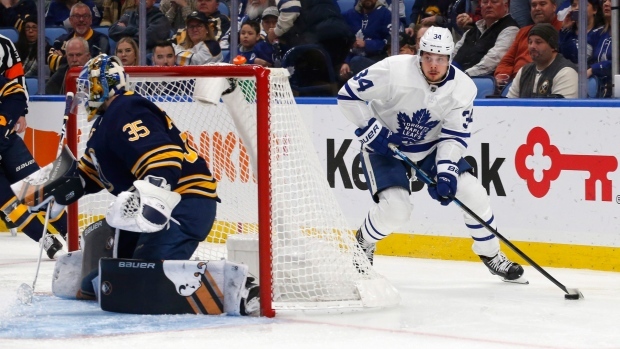 BUFFALO, N.Y. - Auston Matthews scored his second goal with three seconds on the clock in overtime, and the Toronto Maple Leafs matched their best start in 84 years with a 4-3 win over the Buffalo Sabres on Tuesday night. The Maple Leafs won their fifth straight game and improved to 20-8. The only other time in took them just 28 games to reach 20 wins was when they opened the 1934-35 season at 20-6-2. Kasperi Kapanen set up the decisive goal by skating up the left wing and drawing two defenders before dropping a pass to a trailing Matthews. Driving to the net, he got around Sabres forward Evan Rodrigues and snapped a shot over goalie Linus Ullmark's left shoulder. Patrick Marleau scored with 5:13 remaining in regulation to force overtime. Jake Gardiner also scored and Mitchell Marner had an assist to give him 11 in five games. Frederik Andersen stopped 38 shots to win his fourth straight. Jack Eichel scored twice for Buffalo, which dropped to 0-2-2 since equaling the franchise record with a 10-game winning streak. Sam Reinhart had a goal and assist, and defenceman Rasmus Ristolainen set up two for Buffalo. Matthews also added an assist to give him five goals and seven points in three games since missing 14 with a shoulder injury. Eichel scored twice in a little more than 10 minutes during the third period to put Buffalo ahead 3-2. The Sabres captain tied the game by one-timing Ristolainen's pass from the right point 2:39 into the period. Eichel scored the go-ahead goal after Toronto's Nazem Kadri coughed up the puck inside the Maple Leafs blue line. Reinhart got his skate in front of Kadri's weak pass and fed Eichel, who drove into the slot and snapped a shot inside the right post with 7:03 left. Marleau scored 1:50 later when Morgan Rielly's shot from the left point went wide. The puck caromed to Marleau, who came out from behind the net and stuffed it inside the right post. Matthews opened the scoring 8:33 into the second period on a fluke play. Ron Hainsey's shot from the right circle struck Buffalo forward Conor Sheary's leg and bounced high into the air. Matthews was already heading behind the net and jumped up over defenceman Nathan Beaulieu's head, gloved the puck to his stick and wrapped it in inside the left post. After Reinhart tied the game 5 1/2 minutes later by tipping in Beaulieu's shot from the point, the Maple Leafs regained the lead on an odd-man rush with 10 seconds left in the period. Marner sped up left wing and spun around to make a backhanded pass into the crease. The puck went off the skate of Toronto's Zach Hyman and directly to John Tavares, who immediately fed the puck into the slot where Gardiner flipped it into the open left side. Though the Sabres are drawing larger crowds with each win, that didn't drown out the “Go, Leafs, Go!” chants from Toronto fans who made the trip across the border. A majority of people seated in the first seven rows immediately to the right of the Sabres bench were wearing Maple Leafs jerseys. NOTES: Maple Leafs RW William Nylander remained in Toronto where he skated on his own as he continues conditioning since re-signing with the team on Saturday. There remains no timetable for when Nylander will play his first game. ... Sabres RW Jason Pominville is day to day and missed his second game with an upper-body injury. ... Sheary returned after missing four games with an upper-body injury.